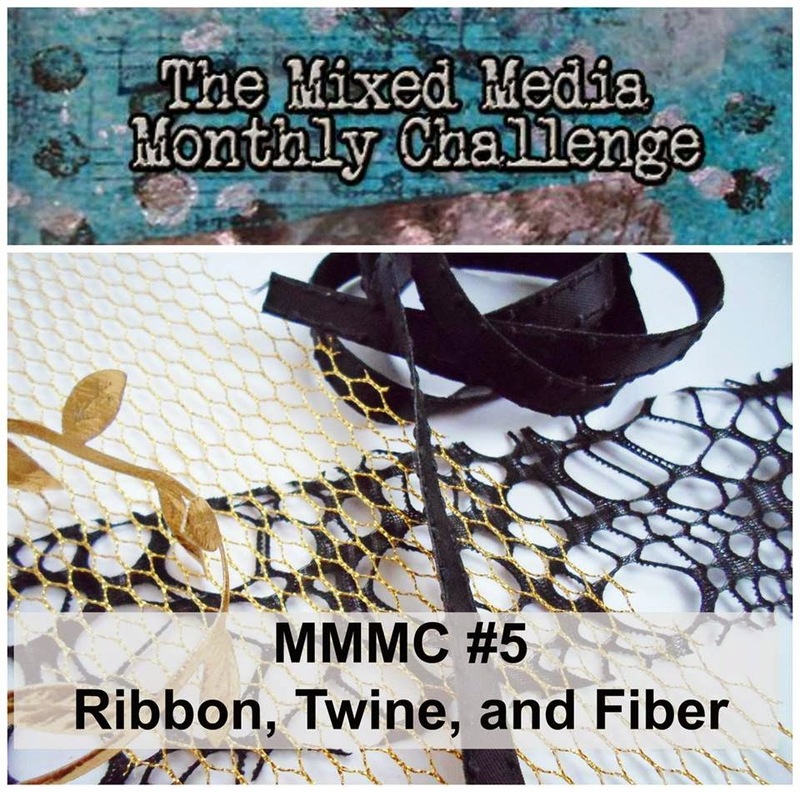 It's time for our 5th Mixed Media Monthly Challenge!1 This month our challenge is to use Ribbons, Twine or Fiber in your Mixed Media Project. Our sponsor is May Arts and they are generously offering 3 full spools of fall inspired ribbon to our lucky random winner. This month I made a Halloween canvas. I colored the background with different paints in halloween colors of orange, green, purple and black. I used some stencils and stamps and made sure to cover the sides. 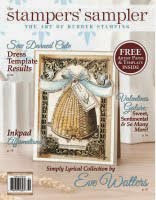 I used the spider web stencil designed by Mona Pendleton for My Favorite Things as a main accent. I sprayed adhesive and covered the web with black glitter. I used some gold glitter on the Time Holtz 31 silver numbers and attached them to the canvas with small black brads from Stampin' Up. I also stamped a Tim Holtz spider on the bottom of the "1" in Ranger archival black ink. I had a bag of glittered Halloween shapes from K&Company that I used for the haunted house, spiders, skulls and accents on the word tiles. I added some black ink and goggley eyes to the spider. To make the word tiles I painted some Tim Holtz grungeboard shapes with Distress Crackle paint in Peeled Paint and then rubbed Distress Stain in Tea Dye on the tiles. The letters are Tim Holtz grungeboard letters that I covered with a mixed purple blend of Stickles. On the bottom of the canvas I added a black web-like trim from May Arts and on top of it I added the gold mesh from May arts (see bottom picture for a close up). I love the texture these fibers add to the canvas. This canvas was so fun to make. 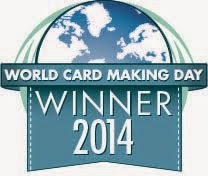 I hope you are inspired to make something really cool this month. 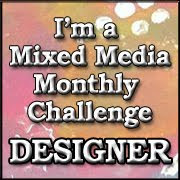 I can't wait to see what you come up with!!! 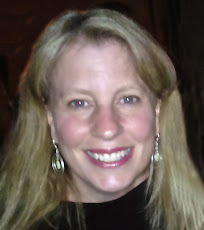 Love your gorgeous canvas, Donna! So perfect for this spooky time of year! Hoping I'm able to play along this month - life is getting too busy lately! This is one very cool creations Donna. 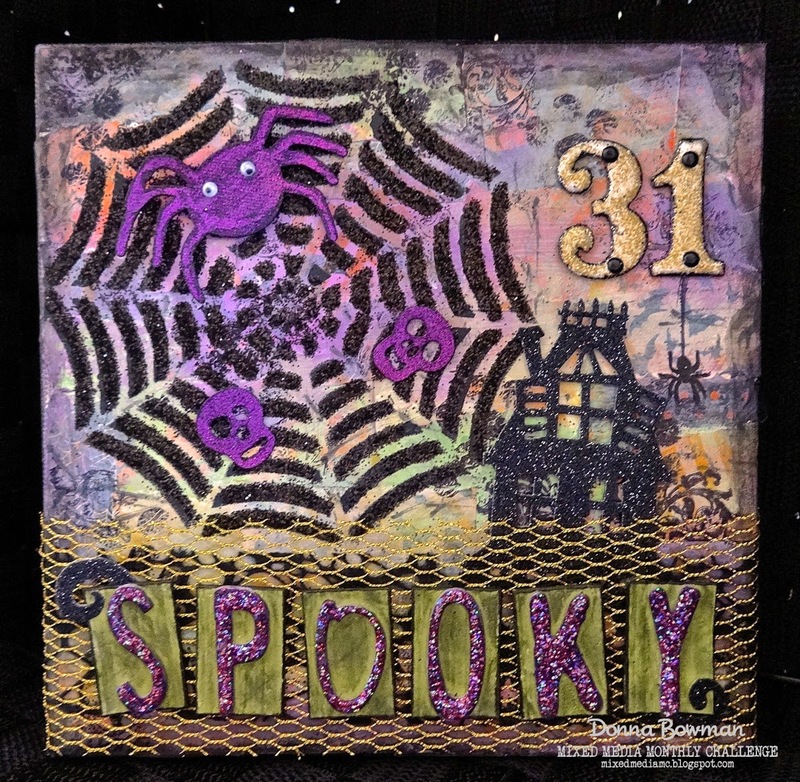 Awesome Halloween canvas Donna!! Love all the glittery elements and the ribbon!! very cool canvas! i always love your halloween projects! !